Back in the day when I lived in New York, I was more than a little homesick. I pined and yearned for my home state of California, and pounced on everything I could find that reminded me of home. I wore flipflops at the very first sign of spring in the city (and narrowly avoided frostbite in the process), I saw the movie Sideways 3 times in the theaters, and bought the DVD when it was released; I traveled all the way to TENTH AVENUE to find a tiny taqueria in the back of a bodega that sold real tacos; I listened to the Beach Boys on repeat. So you can imagine how happy I was when the last apartment we lived in in Manhattan was right next door to a California Pizza Kitchen (it also had a balcony, which means my poor husband was sent outside to grill in 50 degree weather. He was happy when we finally moved to California because I immediately started wearing black and wanting to see foreign films in a desperate cling to my New York days). Now I realize that California Pizza Kitchen is about as truly Californian as Red Lobster is truly a restaurant of Maine, but I was desperate. And the truth is, I kind of liked their food. Sure, peanut butter is not my FAVORITE topping on pizza, and some of those combinations were just weird, but the barbecue chicken chopped salad was quite tasty and quickly became my go to order. And then I moved to L.A., and I could get REAL Mexican food, and if I want fancy pizza I could go to Spago, where it all began. And California Pizza Kitchen was no longer convenient, and when you actually live in California, it’s probably not something you’re going to go out of your way to visit. So no more CPK for me. But I missed that chicken salad. Salty, crunchy, a little sweet, with the tang of barbecue sauce and the mellowness of ranch dressing. I WANTED that chicken salad. So I decided to make my own. 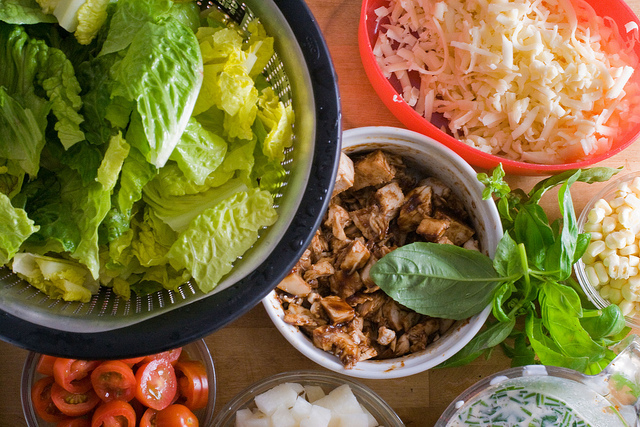 The nice thing about making your own salad is that it’s infinitely customizable. I vaguely recall in the haziness of my memory (I don’t think I’ve had the real version in over five years) that CPK might have put black beans in theirs, but I don’t because I prefer not to. And I don’t know if theirs had avocado, but I like avocado (and really, what’s more Californian?) so I always add some to mine. I would say that you can mess around with this salad as much as you want, but I strongly suggest keeping both the basil and the jicama, because I think they contribute a tremendous amount to the salad (the basil with its bright citrus flavor, the jicama with its awesome crunch). And, as with other iterations of “fast food slow”, making the salad yourself means you know exactly what goes in it. I roast my own chicken (this is a great use for leftover chicken), and buy my own organic tomatoes and cheese. I even made my own buttermilk ranch dressing. I, having a toddler and a full time job and not being Martha Stewart, did not make my own barbecue sauce, but if you’re so inclined, knock yourself out. Preparing this salad is fairly easy, but, like any chopped salad, it takes a fair amount of prep work. Most of the preparation of the vegetables can be done in advance. Combine the chicken and the barbecue sauce. Set aside. Prepare the vegetables: Chop the tomatoes. Peel the jicama and chop into ½ inch cubes. Cut the kernels off the corn. Wash and dry the lettuce and tear it into bite sized pieces. Finely chop the basil. 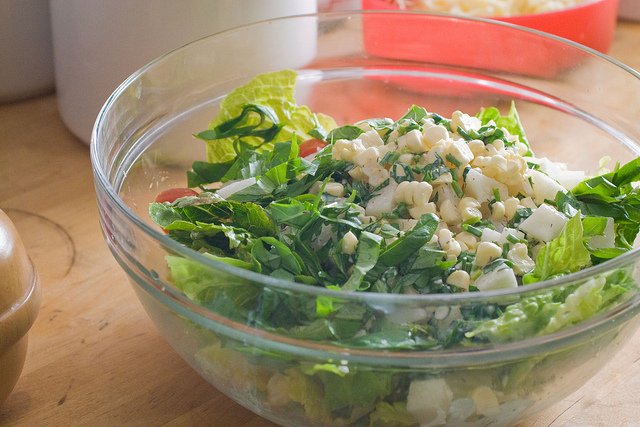 In a large bowl, toss the lettuce, tomatoes, basil, corn, jicama and buttermilk dressing. Divide the dressed salad among four plates or shallow bowls. 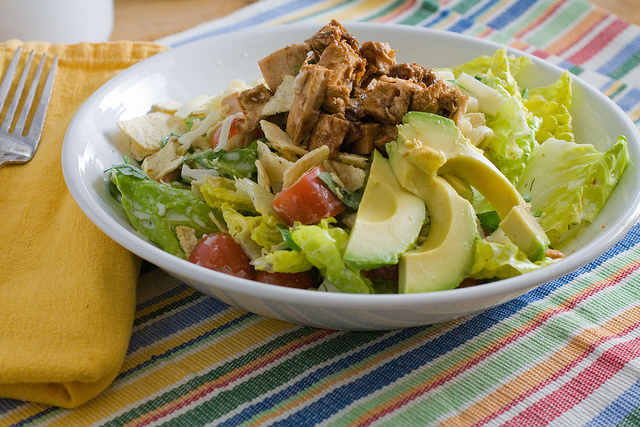 Sprinkle cheese atop each bowl, then add chicken, and finish with a sprinkle of crushed tortilla chips and a quarter of an avocado, sliced. Serve immediately. Every time I eat this salad, I close my eyes and think of New York. Ironic, no? I love this salad, too! Thanks for allowing me to now make it at home! Wonderful! I think I’ve ordered the veg version of that salad! Just a note – CPK does an awesome kids birthday party. All the kids get to go in and make their own pizza. Graham loved it. Where’s the place on TENTH AVENUE where you can get tacos? I work on West 28th Street between Tenth and Eleventh. You should see the changes around here. The Highline, the construction, Chelsea Market, which has a “farmstand” butcher, etc. My boss went to Yale undergrad and Columbia Law too. This sounds fantastic! Ironically I ate this salad and the Chinese chicken salad from CPK all the time in grad school in California…I could call on my way from work and get it as take out on the way to night classes. So I actually do associate CPK with California, but you’re right homemade is SO much better. I’d love to try this at home. 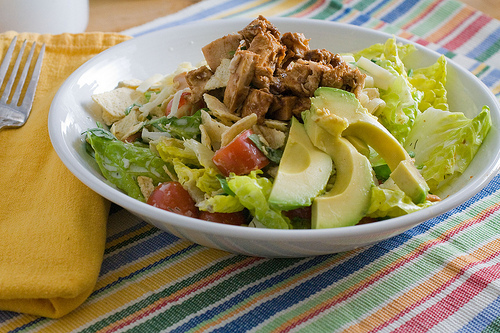 I love the CPK BBQ Chicken Chopped Salad. It’s what I always get when we go. And since I’m such a fan and there isn’t one near me, I may have to try this at home version. You just gave me the perfect idea on what to do with my chicken barbecue left overs. I love barbecues and I tend to cook way too much for my kids and my hubby, so we usually have left overs. This salad looks great, I think my kids are going to love this one! Thanks! This salad is the one reason I think it’s worth making a trip to CPK. Well, that and their potato rosemary pizza. There are way better versions elsewhere, but I still dig CPK’s. Anyway, love this salad and will love making it at home! I’m sorry, I didn’t even get to the recipe because I was laughing so hard at TENTH AVENUE!